A hearty salute to the fried and poached eggs of the world. They are reliable but demand vigilant attention, like a high-strung dachschund. The days have been dependably frigid in New York. Late one morning earlier this week, hunger struck and I wanted eggs. But I wanted them in a new way: warm from the oven. I can't recall the last time I baked eggs at home. I've eaten them that way in restaurants but never think to snag a ramekin and crank up the oven. I remembered there were a few beets in the crisper and a container of Greek yogurt on the bottom shelf. Beets are one of my favorite vegetables. They take well to long-haul cooking, roasted for a marathon session or simmered until they release their woody rawness. But I wanted a quick breakfast. So I reached for a pair of kitchen gloves and the box grater. There is no shame in pink hands. Still, if there are plastic gloves handy, why not be as tidy as possible? 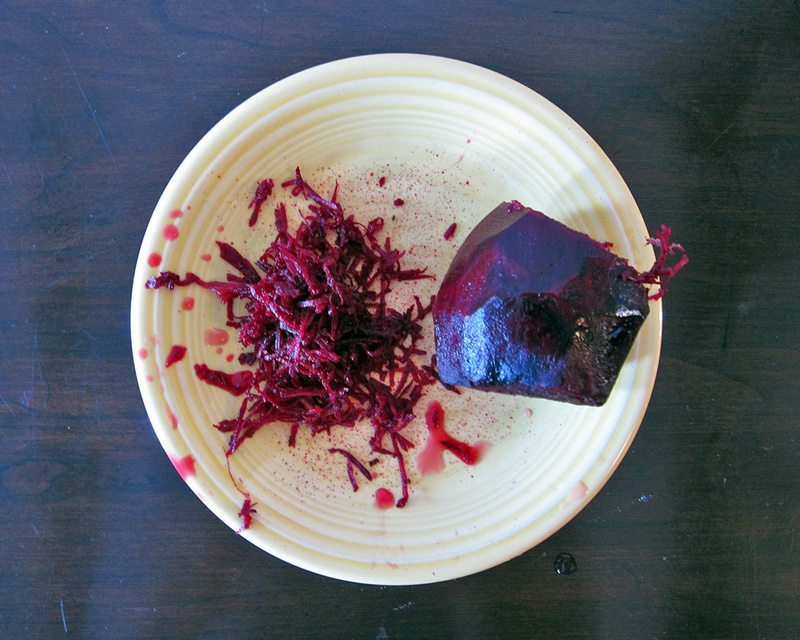 I peeled a beet and, using the small holes of the box grater, grated about half of it onto a plate. I dropped a couple spoonfuls of yogurt onto the bottom of a ramekin, stirred in the grated beet, cracked in two eggs and dusted the eggs with flaky salt and Urfa pepper from Formaggio Kitchen. 15 minutes later, the eggs had turned barely opaque. I removed the ramekin from the oven, and as I started to wiggle a spatula around the inside of the ramekin, I noticed small curds. Crap. The yogurt had curdled. I knew this about yogurt. Much like custard, it prefers to be introduced to intense heat gently, having its finicky essence coaxed into easy submission. 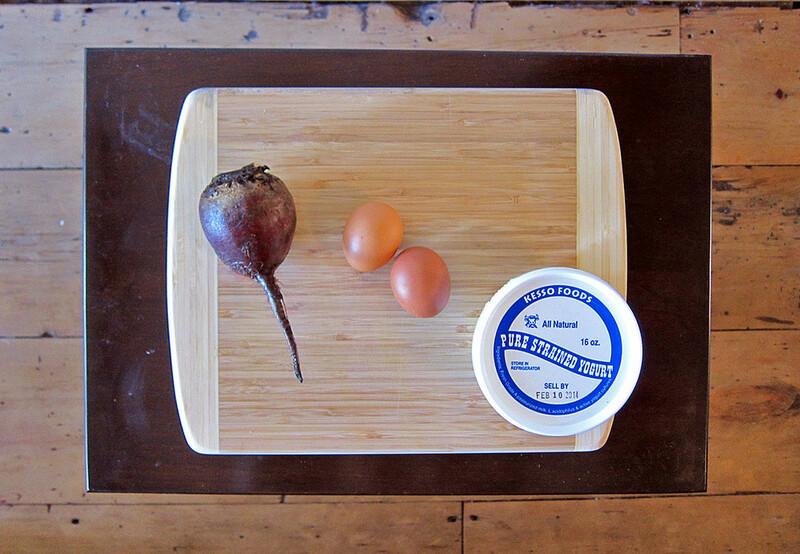 I finished working the spatula in a circle and wobbled the baked eggs onto the same plate I used for the grated beet. There were curds everywhere. Ah well. I seasoned the eggs with some chopped parsley and a bit more salt. Next time, I will try to remember to stabilize the yogurt before setting the eggs in the oven. But if I forget, so be it. Failure is never quite as awful as you think it will be. This dish is easily scaled. Need to cook for two people? Prepare another ramekin. Having four guests over for brunch? Pull down an appropriate number of ramekins. Peel the beet and, using the small holes of a grater, grate about half the beet on a medium plate. Add a few spoonfuls of yogurt to the bottom of a ramekin. (If you'd like to up your chances of the yogurt not curdling, whisk about ½‎ teaspoon flour into the yogurt before adding the yogurt to the ramekin.) Add the grated beet to the yogurt and stir together. Crack in the eggs, then season with salt and pepper. Bake the eggs until the center is barely set, about 15 minutes. Remove from the oven and, using a rubber spatula or spoon, work around the inside of the ramekin to loosen the eggs. Wiggle them onto the same plate you used for the beet. Top with the parsley and more salt.